REMEMOrizer is another of Andy Key's great enhancements for the Memotech MTX. To quote from Andy's site, "REMEMOrizer is an add-on for a real Memotech MTX500, MTX512 or MTX512 S2 computer, built using hardware and software developed for REMEMOTECH. . . . .Its like an SDX, only smaller, faster, cheaper and better. This is the upgrade you wished you'd had in 1984." The biggest advantage of REMEMOrizer is its provision of random access storage for the MTX, i.e., it allows you to load and save software and data from/to SD card, in the same way as a floppy disk drive on the SDX/FDX, rather than the base functionality of the MTX which uses cassette tape storage. Unlike myREMEMOTECH, REMEMORizer does not need much help from the user - it works "right out of the box". The only thing you need to do, is to check/set a couple of jumpers on the board and decide whether you want/need to replace the existing MTX OS & BASIC ROMS. There's so little to do that I can't really classify this one as a "Project", but it is a fantastic add-on for an MTX. Comprehensive setup and usage instructions are available on Andy's website, so there's not too much to add here, although I have created a User Manual based on the information on Andy's comprehensive web pages. You can download it from Andy's site here, or from my site here. 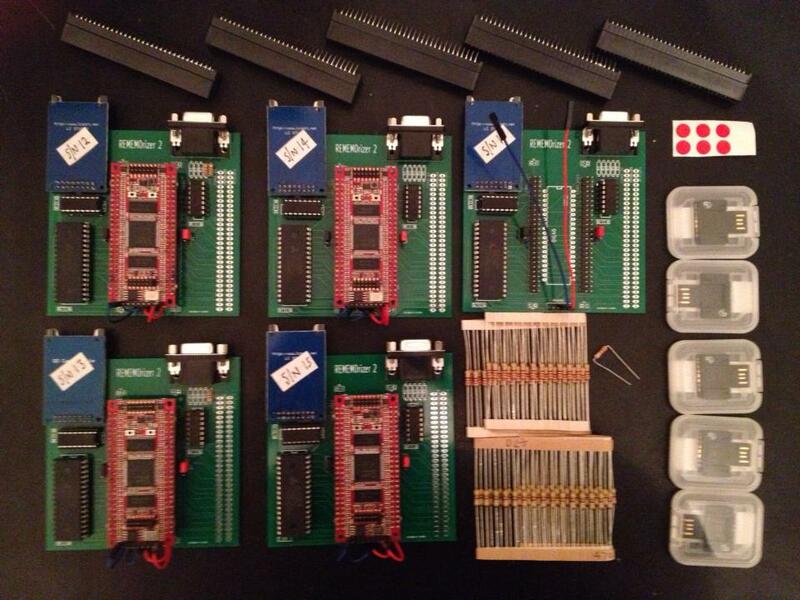 The photo above is my REMEMOrizer rolling off Andy's "production line". This may be the last time that so many REMEMOrizers are gathered together in one place! 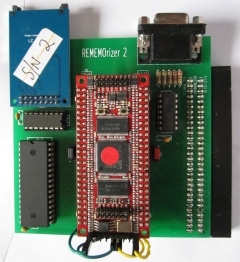 You will notice that the board is labelled "REMEMOrizer 2" - the first version was the first development of the board and was not formally released, board revision 2 is the first publically available REMEMOrizer. 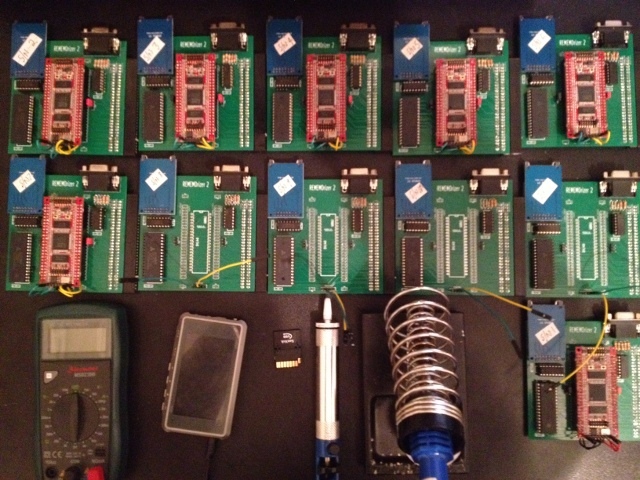 Update 05/03/12: The REMEMOrizer 2 r2 "production line" is now running! Of the initial batch of REMEMOrizers produced, as (bad) luck would have it, mine was the only one that seemed to exhibit any problems. I had problems that seemed to be related to the SD card, particularly during writing. After trying to eliminate a number of potential causes by swapping the power supply, the MTX being used and even REMEMOrizer itself, I returned the board to Andy along with my MTX and PSU for further investigation. Andy found that my machine has a very noisy clock signal, he was able to modify the code to "de-glitch" the clock signal, which has fixed the problem. The red dot on my GODIL signifies that it has been upgraded to r2. REMEMOrizer is great piece of kit, and the majority of users have no problems when using it. However, a couple of users have experienced some problems with the emulated 80 column card output to VGA, as highlighted on Andy's REMEMOrizer Failures page. I thought it might be useful to tabulate user feedback on the subject in this thread on MEMEORUM - the Memotech MTX Forum. If you add your experience to this thread, I will include it in the table on this page.